VCOM Set to Open This Fall in Auburn University’s Research Park - Jay R. Smith MFG Co. The new Edward Via College of Osteopathic Medicine (VCOM) campus in Auburn University’s Research Park in Auburn, Alabama will open the doors to its first medical class this fall. That fact that this building is new construction may surprise many people passing by the building as they move about the campus. VCOM’s mission is to prepare globally-minded, community-focused physicians to meet the needs of rural and medically underserved populations and promote research to improve human health. As part of that mission, one of their goals is to recruit and educate students from socioeconomically depressed regions of Virginia, North Carolina, South Carolina, and Alabama. In addition to the Auburn campus, VCOM also has campuses in Blacksburg, Virginia and Spartanburg, South Carolina. VCOM had a good sense of what they wanted in the way of a floor plan based on their other facilities. 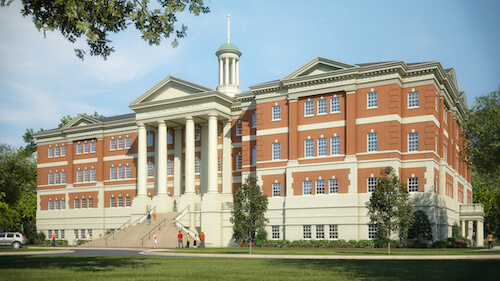 GMC was tasked with transforming that plan into “the best looking building on the campus.” Apparently their vision fit that criterion because soon after creating site schematics and renderings they were told to get a contractor and start building. “We started a movement of designing buildings that fit into the historic fabric now that will still fit 200 years from now,” said Mike Hamrick, architect on the project. Of course, classical revival structures built in the 1700s didn’t have to contend with all the plumbing, electrical and HVAC equipment that we have today. GMC had a few tricks up their sleeve to hide all that equipment on the roof to keep the look of the building. Instead of creating a wall form on the roof they designed a reverse slope so when you are on the ground looking up it just looks like a ridge. They also incorporated a rooftop lantern that hides even more of the equipment. “We’re very careful how we handle those details,” said Hamrick. 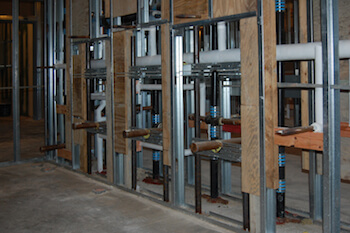 The plumbing work on this project went smoothly and stayed on schedule. “It was a good job with people working together, and good crew that helped each other out. 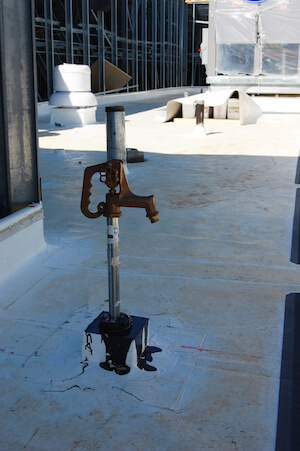 One of the better jobs we’ve had,” said Bill Stringfellow, the supervisor on site for Associated Mechanical Contractors, Inc. (AMCO). Interestingly, this is really just the beginning for Hamrick. His son will be one of those first students who will be studying there this fall.